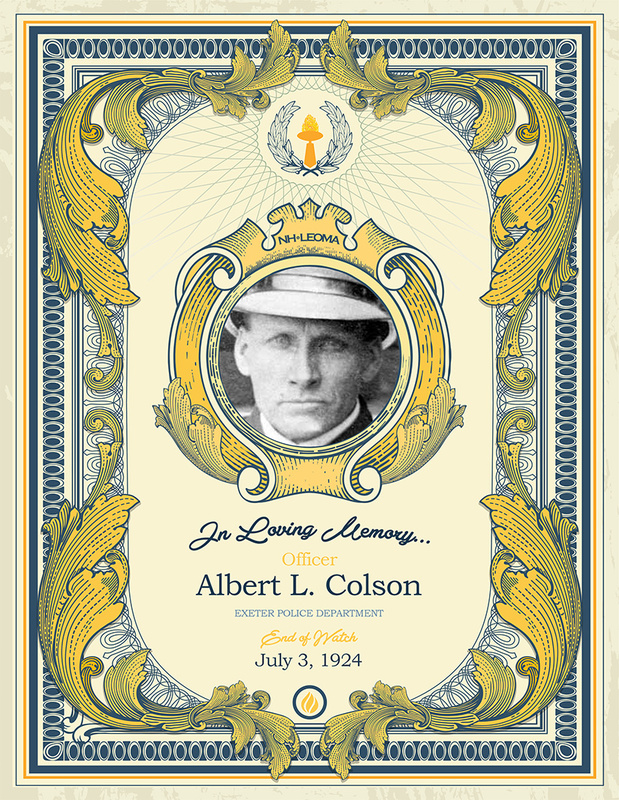 Officer Colson was born the son of James W. and Bertha (Griffin) Colson in Millbridge, Maine on March 2, 1869. He was married to Lillian Reed, in Lynn, Massachusetts in 1891. While serving with the Exeter Police Department on July 3, 1924, Officer Colson, along with his friend and neighbor, Arthur C. Bennet, went to the home of J. Parker McDuffy on Franklin Street. The year before, McDuffy had been greatly annoyed by some local boys the night before the Fourth of July, so this night, McDuffy had notified the police that he would protect himself against any intruders. When the two men arrived, McDuffy was sitting on his steps with a shotgun on his lap. After speaking a few words with him, Colson tried to disarm McDuffy, who pulled out a revolver and shot Colson in the abdomen. Officer Colson died almost instantly. When Mr. Bennett tried to take the shotgun away, he too was shot by McDuffy and died at the hospital a few hours later. McDuffy was persuaded to surrender to police. At the time of his death, Officer Colson was 55 years old. He left behind his wife, Lillian, and their two daughters.